Even if you somehow managed to escape the ingestion of fluoridated water in your younger years, chances are you’ve been exposed to food items that actually can contain about 180 times the sodium fluoride content as fluoridated water according to fluoride expert Jeff Green. This has to do with how what’s known as aluminum fluoride, or Cryolite. Used as a pesticide due to its ability to kill bugs, conventional farmers will oftentimes spray excessive amounts of the sticky substance onto crops. As a result, the aluminum fluoride substance will reside unless thoroughly washed off of the produce. Admittedly it’s not as high as the extra-fluoride toothpaste that is pushed on kids to treat their nonexistent ‘fluoride deficiency’ peddled by some dentists, however it is still a detrimental amount. Plus, it’s more than likely that you’ve been exposed to both fluoridated tap water and conventional fluoride-sprayed. So what can you do about it? Detoxifying fluoride from your body can be challenging, but it is a process that can help alleviate the massive build up of this toxic chemical sold to the public as ‘safe’ and ‘effective’ by pseudo-scientific fraudsters. 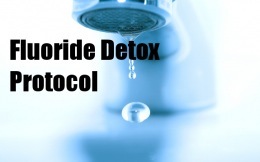 While you cannot go back in time and avoid all exposure to fluoride, you can utilize these methods to detoxify it from within your body today. Listed below are links to blogs that reference this entry: Fluoride Detox: Ousted as Poison, Here’s How to Get it Out of Your System. This page contains a single entry by Toni published on December 13, 2012 5:45 PM. Flu Season Exposed As a Fabrication and Plot By Governments, Deliberately Causing Illness To Promote Vaccinations was the previous entry in this blog. Kenya bans importation of all GMO foods (video) is the next entry in this blog.